There’s nothing worse than a picture with bad lighting. And if you’re a blogger, you know the drill…..NATURAL light is BEST.….Don’t use your flash! We hear it over and over again. But what’s a blogger to do this time of year? You’ve got this great dinner recipe you’re dying to share with your readers. But by the time you prepare dinner (and make your family wait while you photograph it) all the good light is gone. If you have a dSLR camera, you have a few choices; use a tripod, and super low shutter speed and hope for the best, use the dreaded on camera flash (yuck), or spend some dough on a speedlight, ego lights or some other sort of studio lighting. 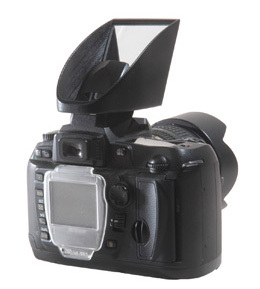 It slides easily over your camera’s hot shoe and redirects your pop-up flash to a ceiling or wall. 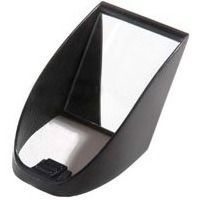 The Lightscoop is a fantastic affordable alternative to an external flash. No more red eye and overexposed faces from using the pop-up on camera flash. You get portability, simplicity and affordability, at just $29.95. See how much warmer and more natural the picture on the right is? I am totally impressed with quality and dimension achieved byt the Lightscoop! Here’s another example with some goodies we made one day ……..I’m shooting with a large window to the left, but it was a dark and rainy day. So after the first few shots I realized I just wasn’t going to have enough light (and I didn’t like my props lol)…..the shot on the right was taken using my Lightscoop! much better! Can you tell I’m Lovin’ my Lightscoop! Get the Lightscoop and save your money for a really cute camera bag! Congratulations to #569 Karen @ Time Crafted I think you’re going to LOVE your Lightscoop can’t wait to see what you do with it!! 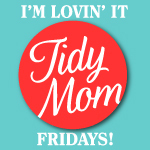 The awesome people at Lightscoop would like to give one lucky TidyMom reader their own Lightscoop! required: Visit Lightscoop and tell me how owning a Lightscoop would improve your photography. Link up to I’m Lovin’ It, and leave a comment letting me know you linked up! Giveaway will end on Feb 10, 2010 at 5 pm CST. 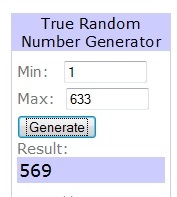 One winner with a valid entry (US resident only) will be selected at random using random.org. I will email the winner and they will have 48 hours to claim their prize. Disclosure: I awesome people at Lightscoop provided me with a Lightscoop of my very own, I was not compensated in any other way for this post. My opions and love of photography and light are all my own. Oh my, where has LightScoop been all of my scrapping life? Lighting is always the culprit on poor photos, with this the scrapping possibilities are endless! The basement playroom, with almost no natural light – now I can get those puppet plays and barbie dream house set ups documented! I Like’d Professor Kobré’s LIghtScoop on Facebook, too! I ‘liked’ LightScoop on Facebook. I really really want one of these! Why have I not heard of this before!! I so need this for all my late night crafting sessions:) I found this on their website: The Lightscoop light is as soft and directional as window light!! AWESOME! This would make pictures of my girls so much better inside! I now am an email subscriber. Wow, how great is that! I would love a Lightscoop!! Email subscriber~ Thanks for all the great posts! Ooooh, you know I would *love* this. Sometimes you just have to use a flash, so why not make it pretty?? My house doesn’t have much natural lighting, so this would be great for taking indoor pictures of my son. Oh my! I NEED this! I just got my first DSLR camera a few months ago and am struggling to turn it off of auto and shoot in manual mode. However, half the time that I shoot, there is no natural light. This would solve this problem! I checked out Lightscoop’s website This would make my life SO MUCH EASIER. I would be able to work on taking photos of my crafts in the evening when my kids are ASLEEP. That would be amazing. I love bouncing flash when I am using my external flash, but I don’t always want to have all the bulk… this would save me when I just want better light without the added weight of a flash. This would help my photo tremendously! Thanks for introducing this to us. I love it! I am always wondering how I can take better pictures. I would love to win the Lightscoop!! I would love to have this to help my photography!! I love this! I’ve never seen one of this, but it looks awesome. I’d love to try it. It would make my photography much better because I have an external flash, but when my toddler is doing something cute (or naughty), I have to quickly grab my camera and I don’t always have time to run and get my flash and attach it. This would be awesome. My dark house makes for terrible pictures! I need lightscoop’s help!